I am using a RPi with Octoprint v1.3.10 and the Astroprint Plugin v1.2.2. When using the Astoprint Adroid app, I am unable to move the printer (ie home, raise/lower z, set temps) when I am on the same network as the printer. As soon as I disconnect from WiFi and just use a cellular network I am able to set temps. If I try to access the octoprint URL by going to Printers>>“Printer Name”>>Info>>WebView, it works fine for one printer, taking me to the correct octoprint ip address. However the second printer will take me to “octoprint_ip”:5000, which does not work. Also, if I go to Print Hisorty>>Activity and look at the Filament Used graph. The bar graph will show the correct amount of filament, however the total at the bottom will be of by a factor of 10. For example, the graph shows I used 9kg grams over the last 6 weeks, however the total at the bottom will show either 0.9kg or 90kg. Hello! I tried mobile version and catch an error witch doesn´t allow you to set temperatures when you are on local network (thank you for the catching) it will be fixed soon. However I didn´t get any error when trying to move the printer and everything work as expected on Android and IOS App. What mobile version do you have? Regarding the second problem is very weird that it gives you that ip. This is the ip that octoprint use when is running on a computer and is not reachable from a mobile. What environment do you have on that second printer? I have version 1.3.1 for Android. The second printer’s setup is the same setup as the first one, Octoprint 1.3.10 with v1.2.2 of the Astroprint Plugin. Yep, I’ve noticed the same thing. It shows I’ve printed 279KG/615lbs which be one pound of filament for each of my two printers for almost a year. 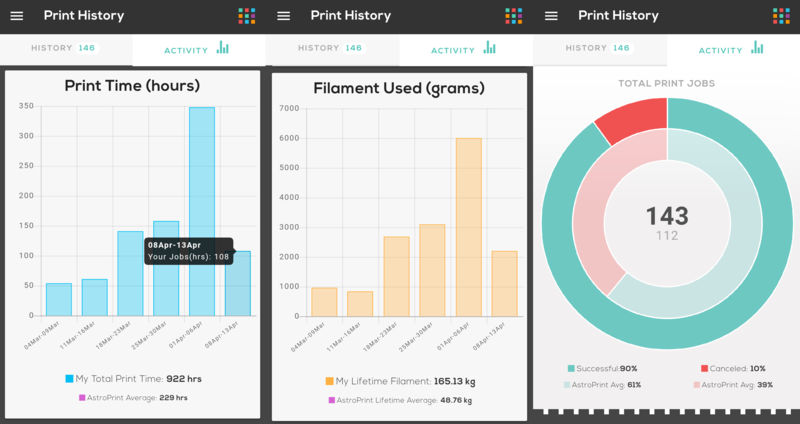 The top bottom of the bar when you bar graph when you go to print history is the total filament that you have used in all your life time wi th astroprint. 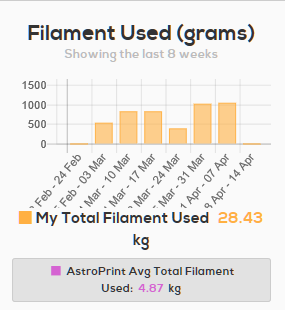 I have only been using Astroprint for about 6 weeks. I am positive i have not used 90kg and used more than 0.9kg in that time. The correct number should be 9kg. Could you please go to https://cloud.astroprint.com/printHistory click in printing activity and check if they are the same values? That way we can investigate if its a plugin issue or an app mobile issue. Mobile app shows 10x those amounts for Total and Average AstroPrint usage. Evidently I can only post one image at a time.